David Sweatt obtained his B.S. in Chemistry from the University of South Alabama before attending Vanderbilt University, where he was awarded a Ph.D. in Pharmacology for studies of intracellular signaling mechanisms. He then did a post-doctoral Fellowship at the Columbia University Center for Neurobiology and Behavior, working on memory mechanisms in the laboratory of Nobel laureate Eric Kandel. From 1989 to 2006 he was a member of the Neuroscience faculty at Baylor College of Medicine in Houston, Texas, rising through the ranks there to Professor and Director of the Neuroscience Ph.D. program. In 2006 he moved to the University of Alabama at Birmingham where he served for ten years as the Evelyn F. McKnight endowed Chairman of the Department of Neurobiology at UAB Medical School, and the Director of the Evelyn F. McKnight Brain Institute at UAB. He is currently the Allan D. Bass endowed Chairman of the Department of Pharmacology at Vanderbilt University. 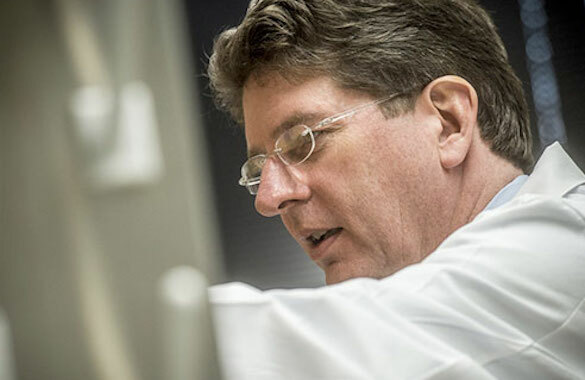 Dr. Sweatt’s laboratory studies biochemical mechanisms of learning and memory, most recently focusing on the role of epigenetic mechanisms in memory formation. In addition, his research program also investigates mechanisms of learning and memory disorders, such as intellectual disabilities, Alzheimer’s Disease, and aging-related memory dysfunction. He has expanded his research program to include developing PharmacoEpigenetic approaches to enable new treatments for cognitive dysfunction. Dr. Sweatt has won numerous awards and honors, including an Ellison Medical Foundation Senior Scholar Award, and election as a Fellow of the American Association for the Advancement of Science. In 2013 he won the Ipsen Foundation International Prize in Neural Plasticity, one of the most prestigious awards in his scientific field. In 2014 he was the recipient of the PROSE Award for the most outstanding reference volume published in 2013, for his book Epigenetic Mechanisms in the Nervous System. The book was also one of five finalists for the 2014 Dawkins Award for the most outstanding academic book published in 2013. In 2014, 2015 and 2016 Thomson-Reuters named him as a “Highly Cited Researcher” and as one of the “World’s Most Influential Scientific Minds”.